In one of my favorite episodes of Parks & Rec (who am I kidding, they're all my favorite, it's the best show on television and I'll fistfight anyone who says otherwise), Ann is telling Ron and April a disgusting medical story from her recent nursing shift at the hospital, involving a man who tried to cut his hand out of a Pringles can. 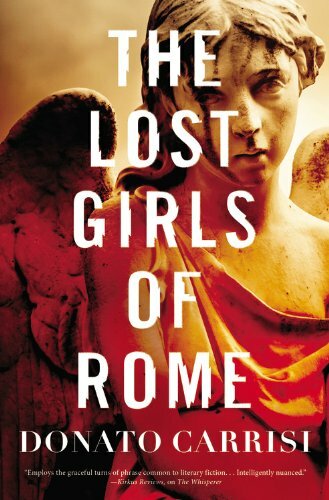 And this, my friends, is what Donato Carrisi's latest thriller is like. It's so multi-layered, so complex, with so many characters involved and crimes committed, there's no way to keep track of everything Carrisi has put in motion. I got to the end and realized I had totally forgotten about the (metaphorical) toe. Carrisi starts with two overlapping storylines and alternates between them, jumping back and forth through time. One narrative follows Sandra, a forensic photographer and recent widow, who is trying to grieve her husband and uncover the murky details of his death, officially ruled a suicide. However, Sandra has come across evidence her husband left behind that leads her to believe he was murdered. Another storyline follows a man referred to as “the corpse,” whose origins and present purpose aren't clear. He doesn't seem to know who he is or where he came from, and his confusion complicates the mystery as a whole. The various threads of the story weave tighter and tighter, until coming together with a final, pleasing twist. Carrisi is an Italian writer living in Rome, where the novel is set. He has clearly taken the time to get to know the city well and incorporates unique architectural and historical features seamlessly into the action. Not only does a character almost get shot in the head, but that character can use an ancient tomb as cover in a chapel built in the 13th century. For my money, nothing takes a murder mystery up a notch like a historic locale full of frescoes.